Have you ever sat and listened to a supposedly official source of information give an official report on certain important events, but instead of delivering the entire story in detail, they only give a small portion of it to the advantage of a certain corporate interest or political group? This actually happens quite often. Too often, we are handed half-truth distortions by corporate media outlets (and sometimes alternative media) under the presumption that we are receiving thorough, unbiased information. Yet many of us forget the fact that the information we receive from various sources is only presented because certain financial entities have paid thousands of dollars to deliver the message to us. The corporate-funded information we receive on a constant basis throughout our daily lives is by definition, biased and is often compromised. Yet how often do we take these sources at face value? There are a number of fallacies and propagandistic distortions we could discuss which we will find within this daily informational distortion. All of these fallacies are well able to take a somewhat reliable message, turn in on its head, and concoct a fictitious illusion where reliable information once was. This article concentrates on one of the more widely influential attributes of the common propaganda—a tactic known as Controlling the Message. But before we get into the heart of the matter, let's take a look at a few of the components of the method. Here is a definition of a method which is commonly known as Cherry Picking. Description: When only select evidence is presented in order to persuade the audience to accept a position, and evidence that would go against the position is withheld. The stronger the withheld evidence, the more fallacious the argument. Logical Form:Evidence A and evidence B is available. Evidence B supports the counterclaim of person 2. Therefore, person 1 presents only evidence A. Employer: It says here on your resume that you are a hard worker, you pay attention to detail, and you don’t mind working long hours. Employer: I spoke to your previous employer. He says that you constantly change things that should not be changed, you could care less about other people’s privacy, and you had the lowest score in customer relations. Andy: Yes, that is all true, as well. Employer: Great then. Welcome to our social media team! Explanation: Resumes are a classic example of cherry picking information. A resume can be seen as an argument as to why you are qualified for the job. Most employers are wise enough to know that resumes are one-sided and look for more evidence in the form of interviews and recommendations to make a decision. Example #2:My political candidate gives 10% of his income to the needy, goes to church every Sunday, and volunteers one day a week at a homeless shelter. Therefore, he is honest and morally straight. Explanation: What information was left out of the example is that this same candidate gives 10% of his income to needy prostitutes in exchange for services, goes to the bar every Sunday after church (and sometimes before), and only works at the homeless shelter to get clients for his drug dealing business. Exception: If the parts of the truth being suppressed do not affect the truth of the conclusion, or can reasonably be assumed, they could be left out of the argument. For example, political candidates are not committing this fallacy when they leave out the fact that they will need about 8 hours of sleep each night. When we understand this definition, we may realize just how common this particular tactic of propaganda is. This definition describes virtually every corporate-funded news report made in the United States in the past 60 years. Every message concocted by these corporate sources was largely motivated by profit and for the purpose of advertising in some form or fashion. Anytime there is some advantage of a party to convince a large audience that some principle or product will change their lives in some way, it is important for us as the audience to ensure a thorough message is being delivered to us. The following definition—which is very similar to the previous—gives a specific reason as to why this responsibility of independent research is so important. Card Stacking: This can also be called Cherry Picking. The propagandist uses only those facts and details that support their argument. The selected reasons are used to support the conclusion. You will get misled if you do not notice that important details are missing. The worst part of card stacking is that it can be very difficult to detect if you are not really knowledgeable about the subject. 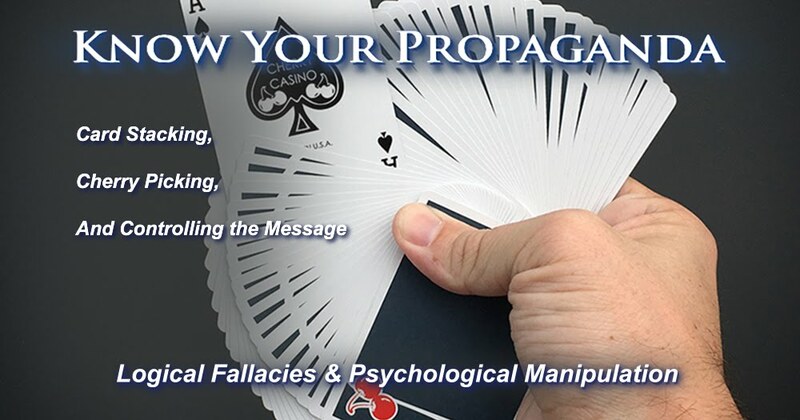 Card-stacking propaganda deliberately misrepresents something to manipulate the audience. Rather than relying solely on facts, card-stacking propaganda will exaggerate or downplay something to suit a specific goal; for example, an advertisements for an unhealthy potato chip brand may emphasize the fact the chips are made out of organic potatoes in hopes that consumers focus on that and ignore the chips' salt, fat and calorie content. You may have noticed that Card Stacking and Cherry Picking are basically the same fallacy. Both of these involve slanting information toward the advantage of certain parties by omitting evidence contrary to the point being promoted. One key point to note is that this type of fallacy in propaganda can be very difficult to detect. Unless an individual is well versed and significantly knowledgeable of the subjects of discussion, they will likely miss the use of this fallacy. If we are not diligent in our independent and thorough study of the subjects in question, the use of the Cherry Picking fallacy can fly right over their head. Cherry picking is a fallacy and tactic of propaganda that could be considered a portion of a larger encompassing tactic known as Controlling the Message. Here is the definition. To control any message typically entails using a conglomeration of fallacies in order to attain the desired effect. A propagandist who wants to control a message may form a political campaign, a panel of experts, or a jury by selecting only individuals who follow a certain list of bullet points in delivering their message or attaining their objective. The propagandist may even use celebrities and popular personalities in attempts to sell a message that is otherwise unpopular to the audience. The celebrities would be given a certain line of dialog and basically paid to behave as though they cared about the cause they promote, when in reality, they are only acting. Combined with the fallacies of avoiding the issue, appeal to emotion, and appeal to ignorance, a propagandist might compose quite the convincing argument to convince the unaware that some questionable agenda is preferable. One well-known example of these fallacies of Cherry Picking and Controlling the Message could be seen in the concept known in the truth community as partial disclosure. This type of disclosure is proposed by several whistleblowers to consist of a collection of half-truths designed to astound and distract humanity from the larger collection of information which would be more detrimental to some financial powers and elitists to reveal. This type of disclosure may involve the revelation of evidence that proved that Earth's history was much longer and more extensive than textbooks have taught us. The disclosure may include information on life on other planets, on advanced technology or cures to various diseases, but in reality the truth of former secrecy was much more detailed and more shocking. The world's population may consider some revelations to be extremely positive, but to learn what extreme measures were taken to maintain secrecy for so long may unhinge their sense of normalcy. The people may be shocked to learn that lives were taken, that wars were fought and countless people were left to die while these secrets were kept locked away. Moreover, any attempt to discuss these subjects in public settings were laughed away as ridiculous by the establishment. The use of the controlling-the-message fallacy in propaganda can be easily seen by anyone diligent enough to learn the subjects discussed. Unfortunately, many people still lack the initiative required to see through this common fallacy. In modern times, children are taught in school to listen to authority and that success is defined by one's ability to obey. They are taught to listen and repeat whatever they hear from anyone speaking confidently. It takes a trained ear and a free mind to see beyond the appearance of confidence and to evaluate a message beyond the common-place tactics which have largely distorted our collective psyche from birth. Chances are that if an individual is openly stating that there is more to learn and that the audience should do their due diligence, these fallacies are not being used on them. Any honest source will recognize the necessity of giving the audience the responsibility to learn all that they can before making any decision. This type of learning is vital, and the more sources we as individuals consult, and the greater the variety of perspectives we are willing to consider before drawing any conclusion, the better chance we will have of ensuring that the conclusion we draw is sound and accurate.